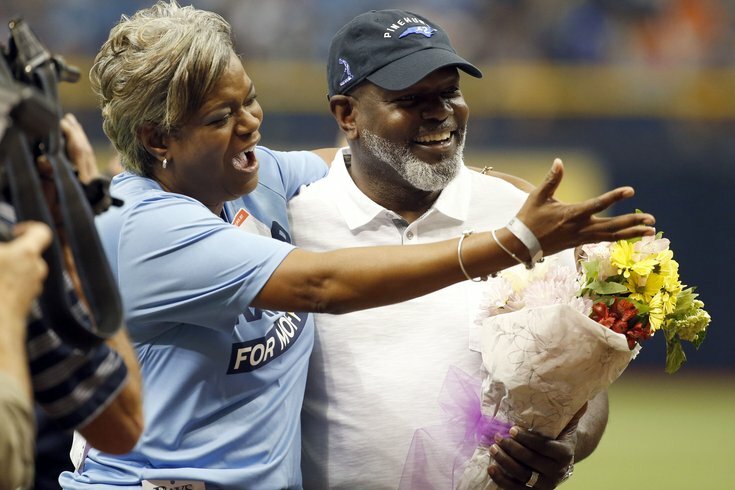 Cancer survivor Marsha Smith is greeted by her brother, former NFL star Emmitt Smith, after throwing out the first pitch before a baseball game in 2017. The overall cancer death rate is dropping faster for black Americans than white Americans, narrowing the gap between the two racial demographics. But African-Americans still hold a disproportionate share of the cancer burden, according to a report released Thursday by the American Cancer Society. The excess risk of overall cancer death among black men was 19 percent in 2016, the report found. That dropped from 47 percent in 1990. Similarly, excess risk among black women fell from 19 percent in 1990 to 13 percent in 2016. The American Cancer Society attributes the overall declines to shrinking racial disparities in lung, prostate and colorectal cancers – three of the four most common types. The disparity rate for the fourth, breast cancer, stabilized in 2010. Additionally, the overall cancer incidence rate fell faster among black men than white men between 2006 and 2015. That drop-off was driven primarily by more rapid declines in lung cancer among black men. Lung cancer is the leading cause of cancer death among both men and women. It causes 25 percent of all cancer deaths among men and 20 percent among women. A big factor for the declines in the lung cancer racial disparities has been a rapid decline of smoking among black Americans, according to the American Cancer society. Over the last 40 years, smoking rates have fallen more sharply among black Americans than white Americans. Dr. Len Lichtenfeld, the interim chief medical officer for the American Cancer Society, called the declines in racial disparities "incredibly gratifying." Nonetheless, black Americans still have the highest cancer death rate and lowest cancer survival rate of any racial or ethnic group. The American Cancer Society considers socioeconomic status – which is strongly correlated with race in the United States – as the major cause of the disparity. "To continue this progress, we need to expand access to high-quality cancer prevention, early detection and treatment for all Americans," Lichtenfeld said in a statement. Cancer death rates peaked among black Americans in the early 1990s after decades of sharp increases. The American Cancer Society publishes its "Cancer Statistics for African Americans" report and a companion, "Cancer Facts & Figures for African Americans," every three years. The report relies on data from the National Cancer Institute, the North American Association of Central Cancer Registries and the National Cancer for Health Statistics.